Unsurprisingly all the polls show that Americans don’t want to get too involved in Ukraine’s problems with Russian encroachment, just as they have been disinclined to get drawn into other recent world trouble spots, including Syria, Egypt and Libya. This is not surprising because in record numbers, Pew Research Center surveys find Americans saying the U.S. should mind its own business and let other countries get along as best they can. Over the past decade, disillusionment with U.S. invasions of Iraq and Afghanistan have been coincident with the growing number of Americans who are reluctant to see the U.S. take an active role in solving international problems. Indeed, a recent Pew Research national survey found respondents saying, by a margin of 51% to 17%, that the United States does too much rather than too little in helping solve world problems. An important thing to recognize, however, is that the public’s current mood of disengagement is consistent with how it sees the U.S.’s global leadership role. 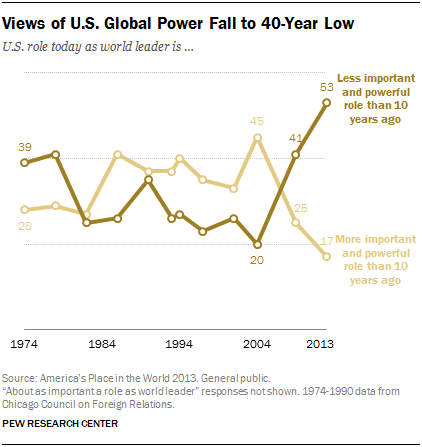 For the past 20 years, Americans have favored a modest international leadership role. Currently just 12% think the U.S. should be the single world power while 20% think it should play a first among equals role. 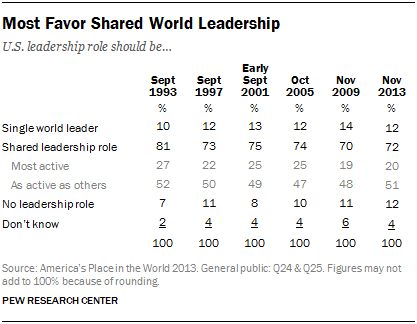 What most Americans (72%) want is the U.S. to play a shared world leadership role. This is a long-standing point of view. Opinions about America’s global leadership have changed very little since the end of the Cold War. Only briefly in the aftermath of the 9/11 attacks did the public overwhelmingly reject the notion that the U.S. should mind its own business internationally. And even then, few Americans thought the U.S. should be the world’s leading nation or even play a first among equals role. And perhaps Americans have come to recognize the consequences of its own inward point of view. A recent Pew Research Center/Council on Foreign Relations survey found the percentage of Americans believing that the U.S. is playing a less important and powerful role in the world climbing from 20% in 2004 to 53% in 2013. However, there is one important caveat to the country’s cold feet about its international leadership. A huge majority of the public (68%) continues to believe that the United States is the world’s leading military power. And only one-in-three Americans think it would be acceptable if another country became as powerful as the U.S. In so many words, the typical American continues to look at world leadership with a fair degree of skepticism and is extremely wary of engagement in areas of conflict. 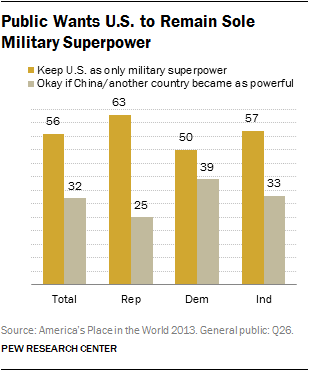 At the same time, most continue to take considerable comfort in American military power. But there is also another increasingly important dimension to the American public’s world view, globalization. An ever larger majority of the U.S. public supports closer trade and business ties with other nations.